I must have read the book Moloka’i by Alan Brennert about two years ago, but it was quickly called back to mind when I saw this Detroit Free Press article in Sunday’s paper. Apparently a local Catholic parish will be taking on a new name in honor of the recently canonized St. Damien of Molokai. Rev. Damien De Veuster “ministered to people with Hansen’s disease, then called leprosy, on the island of Molokai in Hawaii,” and is considered the “patron for patients who have AIDS or HIV,” the Free Press reports. It’s always interesting when what we learn from fiction intersects with reality, and a portion of author Brennert’sMoloka’i will settle here in Michigan when a bone relic of St. Damien finds its place of veneration in a church in Pontiac. 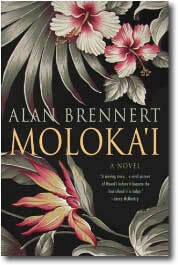 A story of historical fiction, Moloka’i tells the long-overdue tale of leprosy victims and their ostracism to the Hawaiian island of Molokai, where the reverend played a prominent role. A heinous, ravenous, and deceptive disease, leprosy causes the gross disfigurement of body and limbs; turning hands to claws and mouths to mere gaping holes. With a raging fear, men, women and children were torn from their families and transported to the island, where they were often deposited for the remainder of their lives. It is in this vein that author Brennert spins the tale of 5 year-old Rachel Kalama and her encounters with Father Damien. For a full book review, click on this Mostly Fiction piece. Also, try this interview with Alan Brennert on Bookbrowse which provides insight and background on both the author and the book.